oh so pretty! I’ve got some Liberty fabric stashed away from my trip to Paris, but I struggle so much with making Japanese dress book patterns fit me, I’m afraid to use it! Maybe I’ll try this one though cause yours is inspiring. All three versions of that dress are gorgeous, I just might have to buy that book from you! I love it. Really diggin’ the fabric. will be lovely with rusty orange opaque tights for this super chilly weather we’re having! Just a perfect dress! Really love it. Like I said before, you have an uncanny flair for matching fabric to pattern. 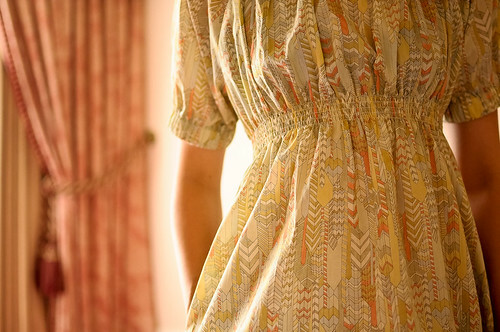 And I really like the way you’ve used Liberty fabric, which I think is not always easy to pull off. Very inspiring. 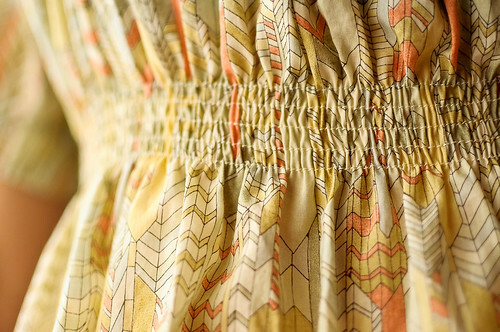 It was this dress, that you were wearing at Sewing Summit, that made me realize I had to get to your blog AND NOW! When you walked away from our table, I right there and then went and spent way too long on the Japanese dress section! SO wonderful, all of it. LOVE! I am definitely ordering books from you…soon as I get Fall and Winter Delish done!! Shirring, is a class I will be coming in for. You are just too cute for words! I’m coming to see you soon. Hot dogs are a must! So much to share. Miss you girl.